Excited to release another beautiful wallpaper from the Star Traders 2 scenery artwork. 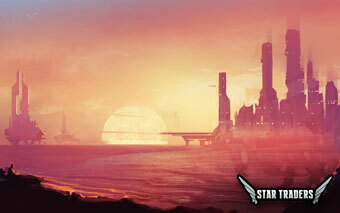 This time, gaze out over the sunset on an oceanic world from a large city outpost. We've prepared 3 sizes for our Patreons: 800x1200 for mobile, 1920x1080p and 1920x1200. We hope you will consider pledging as little as $1 a month to help support us as we keep making games. In return, you get access to sweet digital rewards like these monthly wallpapers! Check us out on Patreon.